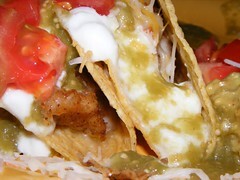 Sunday dinner; Made some yummy fish tacos. Had planned to go to have dinner with friends, but a stomach virus prevented that 😦 I decided on talapia tacos. I lightly floured and seasoned(red pepper, salt, pepper) the talapia then pan fried it and then cut into strips. I warmed some taco shells and then topped with cheese, plain yogurt (healthy person’s sour cream) tomatillo sauce, diced tomatoes and guacamole. This is so easy and pretty healthy actually. I mean, I didn’t feel guilty at all and it wasn’t just because I used plain yogurt instead of sour cream; I think its a pretty healthy dinner all around = and totally delicious. I had it with a nice Malbec which complimented the fish perfectly. We get a lot of responses to the food blog and I personally think its a fun way to share ideas, recipes, and successes and failures. What I also hear a lot is that I am “fancy and creative” as said in the mocking somewhat jealous tone of someone who just knocked out the left over pizza or finished the latest in a long line of stouffers frozen dinners. Well – if it will make you feel better – tonights gourmet dinner for me was half a subway sandwich (from the fit menu at least) and snack pack of doritos – all capped off with a coffee from Starbucks…yeah I am living the gourmet food life style for sure. So..what are your food confessions?? Tuesday dinner. I think the last time I blogged about a pizza it was a Tuesday – no idea if that has any implications and if so what those would be, but never-the-less. It was pizza Tuesday. Kneed together. Form into a ball and let rest for 5 minutes. 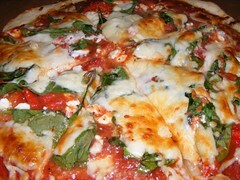 Grease a pizza pan – spread dough onto pan – top with favorite toppings – add cheese – bake for 20 minutes – enjoy! I topped mine with feta, spinach and sundried tomatoes and enjoyed it with a Las Moras Malbec from Argentina – perfection! This was Sunday dinner. It was soooo good. 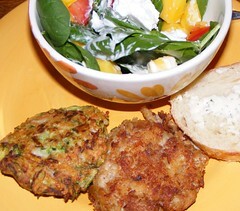 I made crab cakes and zucchini cakes and served them alongside a lovely salad of spinach, mangos, tomatoes and feta. Delicious. I used claw meat – it is very sweet and yummy. I’d say it was about a pound of crab meat. Form into patties and put in the freezer for about an hour. You don’t have to put them in the freezer, but I find this helps them hold together better in the cooking process. When ready to cook, heat about 3 tablespoons of olive oil in a saute pan and add crab patties – let brown on both sides. The zucchini cakes I have made before. Check that out here. 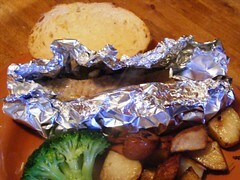 In a sheet of foil layer sliced onion, one clove of chopped garlic, on top place a fillet of tilapia, salt and pepper. Form foil into a pouch; just before sealing add white wine or sherry. Cook in a 375 oven for about 20 minutes depending on the thickness of the fish. Easy, easy dinner- it hardly gets easier than this. I sautéed some shrimp with garlic, olive oil and cilantro; set aside. Cube fresh mango. Heat griddle (or sauté pan) and spray with a dash of non-stick spray. Put tortilla in a pan. 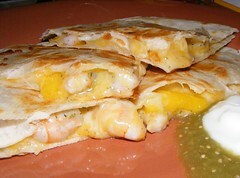 Cover with cheese, shrimp and mango. When cheese begins to melt cover with second tortilla then carefully flip the tortilla and let it lightly brown. Serve with whatever condiments you like with quesadillas. I used plain yogurt and tomatillo sauce. I was a bad blogger and didn’t get a picture, but I think I can describe the flavors and you can picture it your foodie eyes. I was in charge of the starch. I quartered red potatoes and tossed with olive oil, chopped 2 large cloves of fresh garlic and one packet lipton onion soup mix. Preheat the oven to 400 degrees. On a greased pan layer sprigs of fresh rosemary; put the quartered new potatoes on top and then sprinkle with sea salt. Bake in the oven for about 25 minutes (should be tender when poked with a fork). The potatoes were delicious. The taste of the garlic and the hint of rosemary was awesome and a perfect accompaniment to the dinner. I will surely do this again when my rosemary plant recovers and I promise a picture then. Hope you all had a good holiday dinner. I get out of school soon enough so there are sure to be more blogs soon. I have a fresh mango to use this week so I will probably do something with that tomorrow -just have to remember the camera!